Safety and health should be top priorities for any food manufacturer. This why Bona Fide Brewing Company only uses in high-quality, industry-standard Sankey valve kegs. The only nitro coffee kegs that we fill are the Sankey type D, stainless steel keg, and PET (single use) kegs. These two nitro coffee kegs types have numerous advantages over other kegs. They are the same types of kegs that are used for both fine wine and beer on a commercial scale. Homebrew kegs, or what is otherwise referred to as “corny” style kegs cost less and have a removable top. They are great for homemade beer and mixing craft beverages in a private environment. However, this makes them commercially unsafe for the distribution of nitro coffee because there is little assurance that these kegs are tamper-free. Beverages stored in these types of kegs can be potentially contaminated. Alternatively, Sankey kegs have a pressurized valve in place that acts as a barrier to the product inside. It requires a specialized coupler to tap them and a special tool, to open them. In the normal process of cleaning and filling, they never get opened. Only for inspections and repairs after numerous fills are they opened up. Thus, they have the ability to keep the nitro coffee safer. Prior to filling our nitro coffee kegs, we ensure that we clean them using special cleaning agents and sanitizations steps. This eliminates microorganisms and all the other potentially harmful agents. On top of all this, the previously mentioned hot step in our Craft Draft brewing technology exceeds the minimum temperatures and contact times specified for pasteurization. This hot step does not negatively affect the flavor. It does, however, make our nitro coffee more stable and at the same time, safer for you. An estimated 40% of the brewed coffee in America usually ends up getting poured out and wasted. This is often as a result of an overestimation of the adequate brewed coffee volume needed for an event, and then the coffee is held for an extended time while it waits to be served. This situation is commonplace at offices, banquets, restaurants, and other gatherings. The coffee sits around in an urn or a large samovar, oxidizing until it no longer tastes good. Then it gets poured down the drain and the entire procedure is duplicated. Coffee packaged in a keg is more efficient. 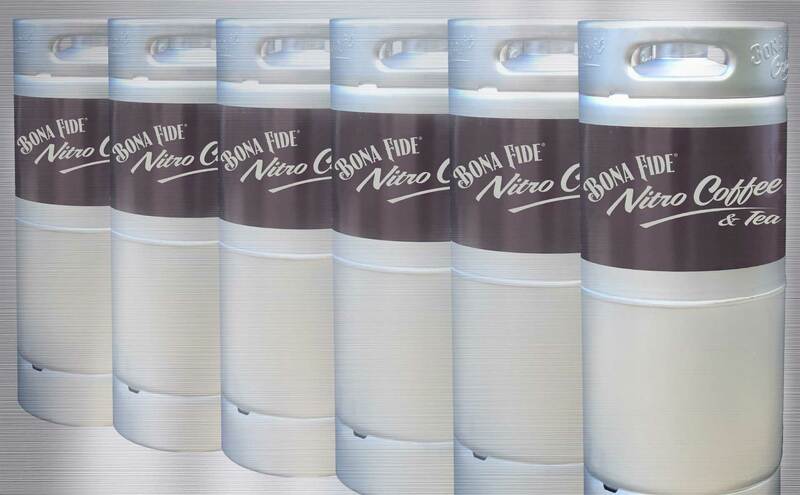 Each Bona Fide keg holds approximately 80 servings and as already described it is sealed, safe and ready-to-tap and pour. In this state, the coffee is literally good to the last drop and it requires no brewing or messy preparation. It stays fresh for an extended time-period as long remains in the keg. Any left-overs partial kegs at the end of a shift can be placed back into cold or ambient storage until the serving time.